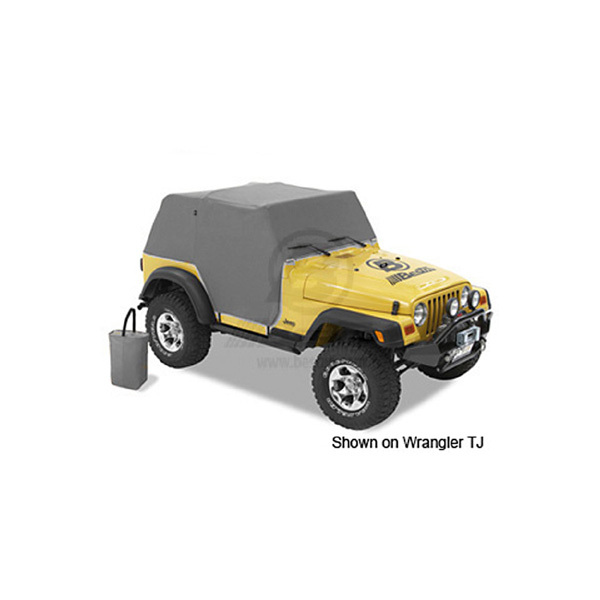 TRAILCOVER CJ/YJ WRANGLER 80-91 CHARCOAL - Jeep Parts Guy - All the Jeep Parts You Need! The new All Weather Trail Cover protects the windshield and interior of your Jeep from the harsh effects of sun, wind and rain. Door opening protection flaps are a new feature offered this year. Adjustable straps are designed to provide a protection flaps are a new feature offered this year. Adjustable straps are designed to provide a snug, tight fit over our other accessories, and ensure affordable protection from the elements. Bestop’s legendary “Fit. Function. Style.” is evident with the premium fabric which is the same material used in Bestop soft tops and accessories ensuring long lasting durability. The fabric is waterproof and available in factory original exterior colors. Each trail cover comes with its own stuff sack that keeps the All Weather Trail Cover neatly stored when not in use.